Action from the 2015 Virgin Money London Marathon. Aaron Scott led the locals home in the London Marathon yesterday (April 26). 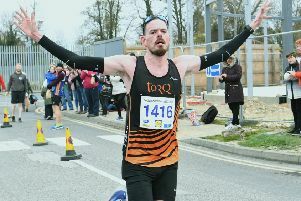 The 28 year-old from Stamford, running for Notts AC and a second claim member of Nene Valley Harriers, finished 22nd overall and was third in the British Championships. His time was a new personal best 2:20:49. Two former Posh players were among the massive field of over 38,000 runners. Adam Drury finished in 3:42:53 with David Farrell clocking 3:59:32.